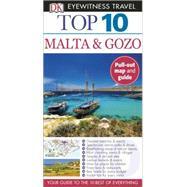 DK Eyewitness Travel Guide: Top 10 Malta and Gozo is your pocket guide to the very best of Malta and Gozo. Make the most of your trip to Malta and Gozo with our Top 10 Travel Guide. Take spectacular island walks and drives to experience the area's natural beauty; tour charming towns and villages, or visit fascinating temples and ancient sites. Your Top 10 Travel Guide can help you find a hotel on any budget, and gives fun ideas for experiencing Malta and Gozo with families and children. Enjoy every bit of your Mediterranean vacation with a travel guide that's packed with great ideas and insider tips. About DK Eyewitness Travel Guides: For more than two decades, DK Eyewitness Travel Guides have helped travelers experience the world through the history, art, architecture, and culture of their destinations. Expert travel writers and researchers provide independent editorial advice, recommendations, and reviews. With guidebooks to hundreds of places around the globe available in print and digital formats, DK Eyewitness Travel Guides show travelers how they can discover more.